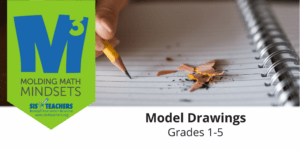 Gain confidence while teaching word problems when you discover the power of model drawing! Armed with a step-by-step method of translating a word problem into a diagram or model, teachers will be able to help students recognize relationships between quantities and build deeper understanding so they can easily solve the problem. Participants will learn how to build competence in small steps by scaffolding these strategies for struggling students as they use these problem-solving techniques to build the foundation for algebraic thinking, even in early grades!